Been a while since I have posted and trying to get back into it again so thought I’d start by sharing a Sway of what I got up to in work last week it definitely wasn’t an average week thats for sure. So how do we fix this games/computing gender problem? I posted a short reply to a post on facebook earlier by David Renton on how to get more women into games courses and wanted to compose this post in order to elaborate further. So how do we solve the problem then of getting more girls into games or even computing in an ideal world we stop genderising things whether they are toys, jobs even hobbies. It won’t happen overnight or even at all however it’s a start right? OK so it’s not the ideal world how can we help change the notion that Computing & Games are for boys. I’m using these since that’s my specific area however I’m sure there will more subject examples dominated by one or the other gender and seen to be girly/boyish. Education I believe plays a part in this and helping demystify some stereotypes. I have for 6 years been researching in primary schools and I firmly believe this is where we need to start. Children learn from an early age and they learn from us. It’s our responsibility as adults to show them the opportunities out there and to show that no matter their gender they can do anything. So why don’t we teach them then how to make games in schools (yes it’s part of our Scottish school curriculum from Primary 5 onwards) and it’s been on my radar for the past 6 years. 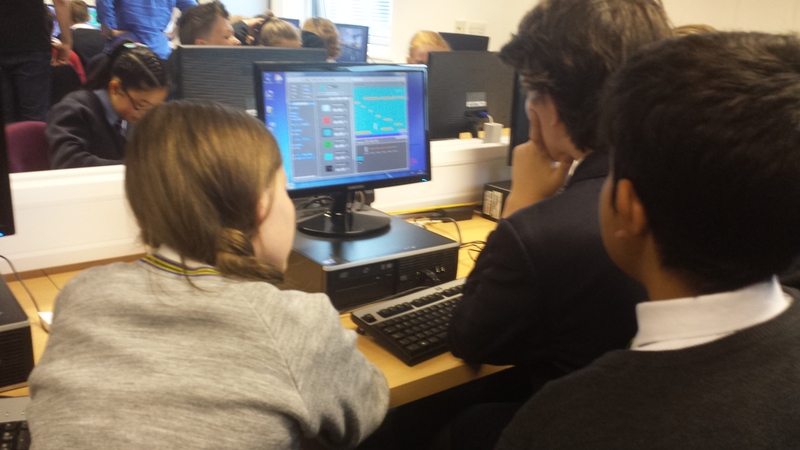 I’ve been trying on my own to get more children in Glasgow (there are other folk doing fab things across the country) into games by teaching them how to make games using Scratch – in school lessons I should add. My research focused on working with nearly 400 children between the ages of 8-11 and teaching them and their teachers how to make games. The children worked in pairs and not once did I ever hear/see anything gender related towards the games that were produced. The only gender issue I encountered was a couple of P6 or 7 classes who when told they would be working in mixed gender pairs gave the ever so awkward pre-teen look of how can I work with a boy/girl but after 2 minutes that was forgotten about and awesome games were soon made. Primary is a very important stage of education as it forms children’s opinions on subjects they like and dislike. By giving children positive experiences of games construction & computing in general. However this then needs to be reinforced throughout secondary school also and children need to be able to have the opportunity to carry on seamlessly from primary to secondary. This is where I had the idea of an event that lets primary and secondary schools work together. A Mini Game Jam – a game jam is where folk get together for 48 hours in the one space and form a team and well, make a game. My idea was shrunk down for the school day. I envisaged that after teaching the children during my research they would have some game making knowledge – enough to make a small game – to be able to work in a team and have some fun while doing so. Hence the Mini Game Jam was born. I am now into year 4 of the event which schools are now starting to see the benefits of. Last year I worked with 300 children over 6 events to spend a day working on a game based on a given theme. By putting the children into mixed teams and not making a fuss about it they worked together side by side as it should be. By showing primary and secondary schools how both can work together for one little part of the curriculum it might help sow some seeds. Given what I’ve seen during my years of research in schools I don’t believe solely in “women into x, y or z” events. However they may be a short term fix but we need to think long term for these ideas to stick. Also OK why not women only classes for getting more women thinking about the subject I dont mean full on the whole 4 years or that but getting an introduction would maybe be helpful. I chose my subject at university knowing that yes it would probably be male dominated but at the end of the day my choice was based on what I wanted to learn not the male/female ratio in the class. There isn’t an overnight “Women into “ course and suddenly uptake of FE/HE even Nationals/Highers goes through the roof, no this is a long road and we all must be in it together to work and change attitudes from early years onwards otherwise we will still be having this same old conversation in 20-30 years time. I know I’m working at it are you? Finally time for the final. 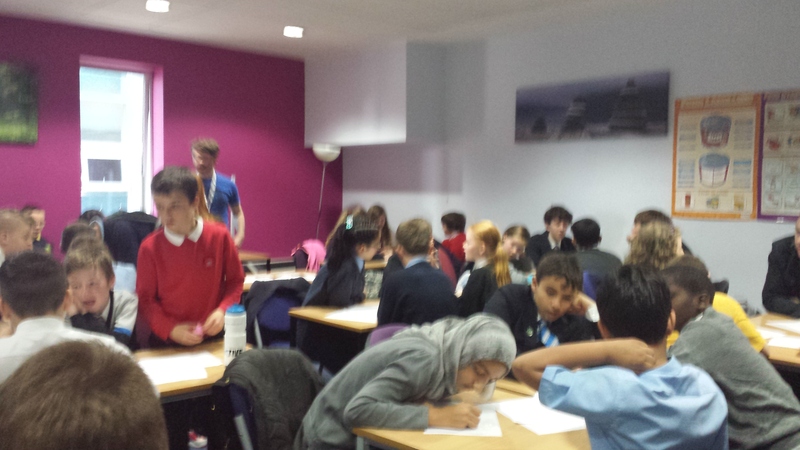 13 teams from 17 schools across Glasgow (& 1 team from Fife) gathered at Glasgow Clyde College on the 17th June 2015 to participate in the jam final. After a brief introduction the children moved into the design room – a room we set up so that the children could focus on getting their ideas down on paper before moving to the computer room. The children had been told beforehand what the theme was going to be for the jam – Glasgow City of Science. So that they could do some research and get ideas for their games. This meant that when they got into their teams they could share what they had brought with them and together come up with their game ideas. 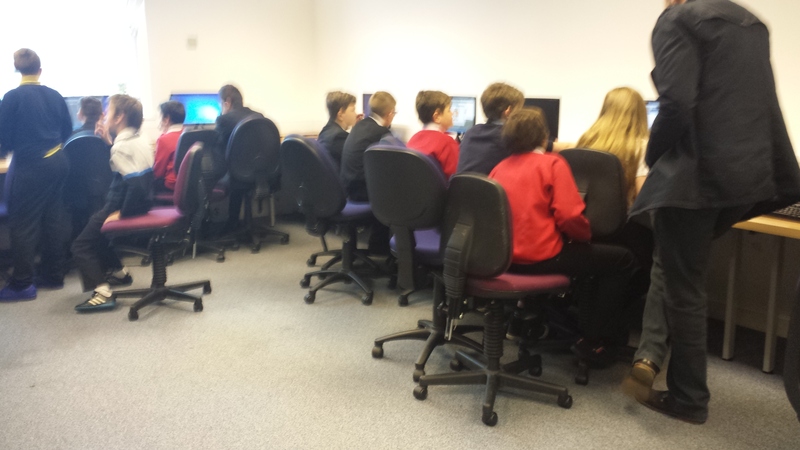 The children spent around 30 minutes planning their games before we moved into the computing room. The bonus of being in the college was we had use of a large lab which meant all teams got to be in the same room. It meant they weren’t split across rooms and it was easy for the helpers to then see everyone during the day. 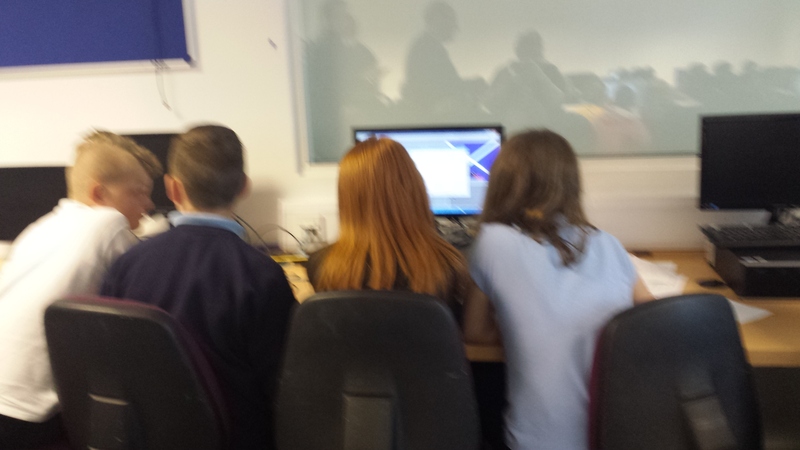 The room was buzzing with excited children working hard on their games and discussing their plans. Some teams were heard having discussions about the use of imported images with one of them telling their team members they felt that it was wrong to be using other pictures and that they should be creating their own for their games. This is something I do try and encourage children when using Scratch be creative don’t just simply use the standard images or download pictures – make your own, put your stamp on your game. After the lunch break the race was on for teams to get their games finished and working. Sometimes this was the frustrating part for teams they’d get one thing working and break something else however persistence pays off for those who keep on trying. In the end the team of judges had to work hard to decide who was going to win. The games were judged on how relevant to the theme they were, complexity and functionality. We still looked at how teams worked as well overall. Both the teams who were runner up and winning had great dynamics within their teams and that showed all day. The winning team was a team of 3 from Rosshall Academy and Sandwood Primary their game is about Clyde collecting science items (though he has to avoid the Bunsen burners) and can be played here. The runners up game was created by a team of 4 from Alexandra Parade Primary and Sunnyside Primary. Their game is about a mouse in a lab and you have to navigate the mouse through the lab to get the cheese and can be played here. Well done to everyone who participated on the day though they all put in a great amount of effort and made it hard to make that final choice. With thanks to Chihiro Yamada, Sean Ward, Alex Malcolm, Stephen McArthur , Connor Johnston, IGDA Scotland, Class teachers and Pupil support assistants who accompanied their children, David Moffat, Susan Grant, Caledonian Club, The NoPills Project and John Lawson. Extra special thanks to Kate Farrell for all your support, Computing at School Scotland for all the help, School of Computing at Glasgow Clyde College in particular Morag Roberston, Kevin MacLean and Iain Shand for all the help and support with the final. Most importantly thanks to all the head teachers who have supported me by wanting their schools to take part in the Mini Game Jams. The children were amazing and you should be extremely proud of them all. What’s that I hear you ask? Well Mini Game Jam is an idea I came up with in 2013. It’s a very simple idea have Primary children spend a day making games using Scratch with their peers from another school. Yes that’s it. No fuss just fun. Children can not only be consumers of games but they can be creators and that to me is important, having children know they CAN do more than play a game. But how did I get to that point? 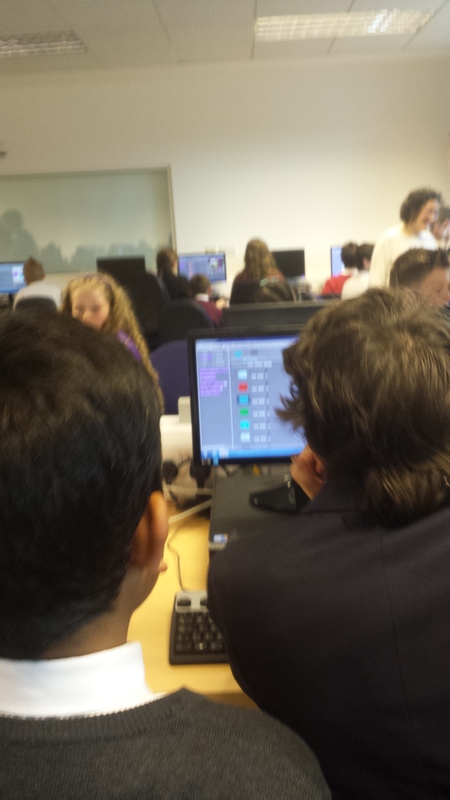 Ever since my honours project in 2009 I became interested in teaching children about computing using Scratch – a visual easy to use programming language. Once I moved onto my PhD I shifted focus from simply teaching programming concepts to children to introducing them to Games construction using Scratch. During the research period over a couple of years I was lucky enough to work with over 350 children in 3 schools. I spent 8 hours with each class teaching them how to make a simple game and then let them explore Scratch to either extend their game or create a new one. 350 children created 178 games (pair or group working) and not 1 is identical!!! It was great getting to go into primary schools and work with the children who loved every minute of their lessons didn’t feel like research at all!! From this came my idea, in the final stage of my research I was working with 2 classes from 2 schools and thought it would be great if they could put those skills to use and have both schools work together. At this point also I was getting more involved in what was happening within the games community in Scotland and was hearing more about the Game Jams that go on. This then gave me the idea why not hold a game jam event for children? On a smaller scale naturally. 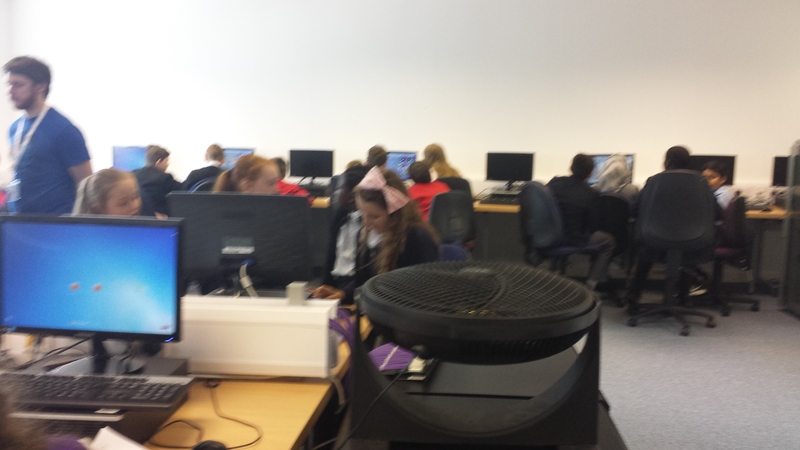 After persuading both schools my idea would work I made arrangements and on the 19th June 2013, 50 P7 children from 2 schools took part in the first ever Mini Game Jam for Primary children at the University of the West of Scotland. It was a memorable day firstly because when the children were told they were being put into groups with children from the other school I had 50 pairs of eyes saying “that’ll be right”. The jam took part in a big university lab and I was lucky enough to have the help of 4 awesome lecturers. However it worked and it worked well. So much so that I was asked by one of the head teachers if I was doing it again the following year I replied “you must be mental”. It was tiring, it was mentally and physically exhausting but you know what got me through was the children. Seeing how well they worked together, how much fun they were having, it just made those wee daft worries go away. Though deep down I knew that this was the beginning of something pretty amazing. One of the schools I should say is my kids own school and for the past 4 years anything computing related I’ve been helping with (but that’s a previous post!!) Sure enough the next school year appeared and my “you must be mental” quote I must have forgotten about as I had started making plans with the head of the school I help at and from that moment on Mini Game Jam was properly born. See the thing is yes I’ve a great idea and it did work but it needed selling to other schools, that I couldn’t do but with the heads help my idea became a bigger reality and year 2 saw 4 schools from the learning community take part (100 children) and again another great day for all involved. Year 3 is underway but word got out across Glasgow and instead for 4 schools in 1 learning community (Smithycroft) there are now 254 children in 21 schools across 4 leaning communities taking part in 5 events. 4 local event plus a final that’s being held at Glasgow Clyde College Cardonald Campus on June 17th 2015. I am extremely proud that I’ve came up with an idea that not only hits those elusive Experiences and Outcomes for Curriculum for Excellence (the lessons beforehand take account of the Technologies section and in particular TCH-209a that looks at games design). But it’s about far more than hitting a target. Over the past few years I’ve become very aware of the gender divide from either reading about Women in Computing or Games articles. I’ve saw a lot of get Women into XYZ and yes I do agree Women are underrepresented in fields such as Computing and Games. However the more time I’ve spent studying the more I realise this is not a priority of mine at the moment. Yes we do need to encourage more women in these subjects but for me the main priority is getting children interested. It’s about getting them interested at an age where they don’t understand that there is a whole gender bias. Where we can educate everyone can do anything and not worry about being a boy or a girl. If we get this right at primary school we surely set children up for a future that looks beyond gender. Not once in any of my research lessons teaching about games construction did children mention anything about that’s a boy’s game or that’s a girl’s game!!! In fact I guess the only gender discussion that happened was at first when the suggestion was made that they work in mixed gender groups. Once the initial shock of that had happened there was no other significant gender results to report. All boys and girls just got on with it and made their games as it should be. As an outsider to the games discussions I’ve seen – I do consider myself an outsider as I don’t truly feel I should belong to the gaming community being that well my degree is in Computing and I am kind of a newbie when it comes to gaming. I don’t teach games and I don’t make games per say. However I have spent over 3 years researching and teaching children in Primary Schools to make games. To me that’s a big thing. 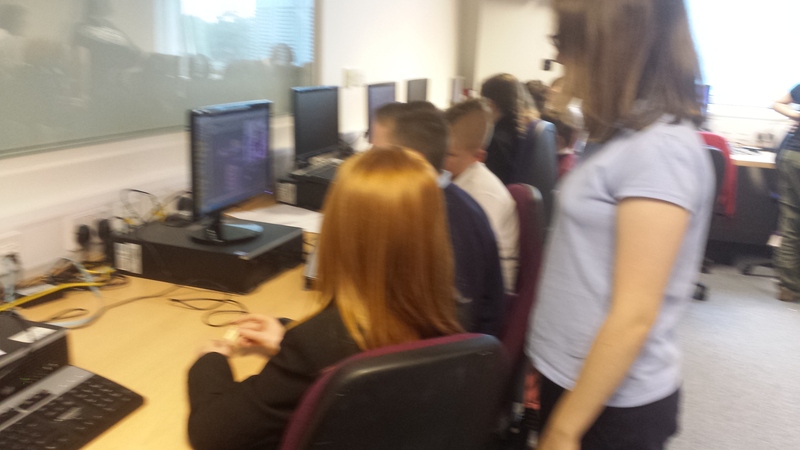 Teaching the next generation of game makers – well maybe not teaching? But inspiring them through the research and through events like Mini Game Jam. Gender should not be an issue and I don’t make it one at Primary level. Education is the way forward to break the gender cycle and it should be the norm for all to be involved in gaming by doing the Mini Game Jam and by introducing game construction in primary schools it should change the way of thinking for all involved in games. I’d love for more games industry folk to get behind my idea and help me promote the Mini Game Jam. This year it has gotten bigger and there are nearly 300 children involved within Glasgow. A small portion of children attending schools across Glasgow but given in year 1 I had only 50 children taking part this is a great leap for year 3. I hope that for next year the rest of Glasgow Primary schools see the benefit of taking part and many more schools will be having local jams – a model that should be able to roll out across the country for more school to get involved. A few thanks to folk who have helped me – to Simon Kelly for believing in my idea and helping get it off the ground. To IGDA Scotland for helping get the word out about my event. To CAS Scotland thanks for getting involved this year and helping out it’s going to be a great but busy few weeks. To all the volunteers who help out at the events the day wouldnt be the same without you. Most importantly though thanks to the schools and to all the children who take part you all make it worthwhile and your enthusiasm means that the children in the year below you want to get to go next year! !